Tales of Moran Preview | Would you like some tea with that? Here is a short preview, for those of you waiting for A Sincere Attempt at Writing Tales of Moran to be published. Hope you enjoy it! Why not write about Moran? Really, the question should have been, why haven’t I written about it before now? What some consider the most prestigious place to live in the whole of our little world just happens to be the place where I have spent the past forty-two and a half years (forty-two and a third, if you discount visits to estranged family members). People tell tales of the times when they stepped foot on its beautifully paved streets, meandering about the town center, their eyes caught by beautiful sculptures and delicate silver jewellery. They praise even the small street vendors selling warm, spiced wine in the winters and refreshing juices in the summer. Indeed, why not write about Moran? Simple – I hate it. Sure, there are things I like. St. Sorellen’s Cathedral is a wonderful example of modern architecture doing its best to appear ancient, but failing admirably. These are subtle failures, really: high quality building materials that did not exist centuries ago, statues so regularly polished you can see your reflection on them, or better yet, the most comfortable, cushioned pews I have ever had the fortune to sit on. There is also that little café five minutes from my home. This one equates brew quality to strength, and sees a persistent stream of young men and women trying their best to indulge in their coffee while hiding obvious disgust. Even better: Margaret’s Library, self-proclaimed owner of the most unique books, books of which there’s only one copy. Now, there might be a reason why there’s only one copy of them, dear Margaret. Could it be that no one wants to read them? And so, with sudden motivation, I ambled over to the library’s section on social commentary during a chilly autumnal afternoon. The section was as devoid of readers as the one dedicated to our Minister. You have to wonder why this Augustus Beren deserves a whole section’s worth of biographies; all he does is sit on a red velvet chair and tell the DoC (Department of Commerce, for those don’t know) that yes, they should pay more taxes. …But I digress. The first book I pulled out was On the Habits of Court Nobles, by someone called Dorian Stanhope. Clearly Mr. Stanhope enjoyed blathering on about the ridiculousness of court speech patterns and the how-to’s of inviting a lady to dance. The book itself read like a collection of thoughts, ideas thrown forcibly onto a page, a page that was not happy to receive them in the first place. And to top it all off, the writing of this First and Only Edition was appalling; somehow needlessly flowery and sporting a lack of attention to detail at the same time. I counted no less than sixty-seven grammatical errors. The book was fifty-two pages long. I walked away from Margaret’s. Not in disgust, although I would have given a few more minutes, but escorted by the wonderful librarian Mr. Reneve, who had decided that smoking was somewhat detrimental to the already fragile First Edition Books. Yet another failing of the prized tomes? He thinks not. But my mind was too distracted to really care as I lit another cigarette. The smoke slowly curled around me on this clear evening. It was almost my favorite part of the day, with the sun recently set and a sky taking on the most beautiful midnight blue. Children are already back in their homes, and silence reigns. Stars pierce that dark sky as the outlines of trees are shaped like large creatures, waiting, stationary, ready for the opportunity to pounce. One could say the evening was at its peak. But back to more pressing matters. This Dorian Stanhope. He wrote a book that might as well not have been written. It had been read by approximately a dozen people, all of whom had pretended to enjoy the peculiar style of writing, so different from Mr. Fancy Stanhope’s other books. They talked excitedly amongst themselves, about his commentary on the modern life of those born into money, quoting a few key passages. All the same ones. The ones the author had purposely underlined. I imagine Stanhope McFancy is laughing somewhere, thinking of all the people who enjoy his books, who think they understand what he is speaking about, when in actuality, they are the people he’s ridiculing. Oh, and let’s talk about one of Mr. Fancy’s other books, They Rise from the Shadows. Does it sound like a bad horror story? Well, it is. It contains everything you expect from a horror book, with its obvious twists and turns, the imperative shrieking woman calling for help while deranged squirrel people rise from the forest, wanting to consume all the fruit from the harvest. My apologies, there was a drought this year? Well then, human flesh will have to do. It was as if someone had told him to write the most absurd book he could think of, and he happily complied. Other titles of his include Forgotten Letters From the Past, a drama heavily lacking in drama, and Oh My Word, which reads like a list of minor infractions the author would carry out, were he not afraid to spend a few days in the local jail. And he doesn’t even have the decency to use a pen name. I went back the next day and asked Mr. Reneve-the-librarian where this Dorian Stanhope lived. Mr. Reneve was quite rude, really. He stood there with his mouth open for three and a half seconds, then quickly closed it and looked around, as if searching for help. He arranged his glasses with his right hand, while his left twitched at an alarming rate. I think it must have been the nerves at actually being confronted by someone who was interested in those rare books of his. But as it turns out, this Dorian Stanhope was me! I should have known, really. Who else would write such rubbish? The writing style, changing constantly from one book to the next; pages upon pages of thoughts, of no interest to anyone but the very rich, very bored patrons that would drop money on his lap just to read his mindless ramblings. And the variety! There was always a new and exciting topic to prattle on about, from the strongest moral dilemmas faced by pet canaries to the reason why asking for two sugars is considered more polite than asking for one. And somehow, I have driven the topic back around to the point I initially wanted to make. I don’t care about my Moran. My Moran is a collection of indecent people looking to play The Game like everyone else, some taking advantage of everyone they meet, others happy when taken advantage of because that is all they know. No, I want something else. 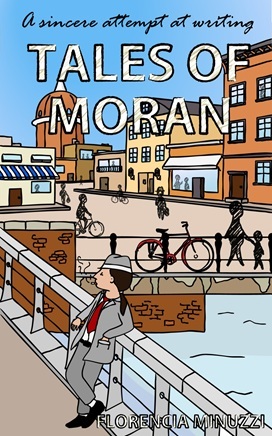 I want to write about other people’s Moran. What is this decrepit, fake excuse for a well-to-do city in the eyes of someone else, I wonder. Maybe that young child thinks of it as his safe haven? To the lovers, it’s a collection of hidden rendezvous points, and to the local businessman, somewhere to prosper. I was not sure I could interview those people and transcribe their thoughts. Without puking, I mean. The best way to do this would be to ask them to give me a few pages, written by themselves, describing what their Moran is like. Of course, this arrangement would be good for them too – the fame and glory of being published alongside my name! It would allow me to ask people what I wanted and give them some time to think it through, reducing the chance of pointless statements by about seventy percent. And best of all, I could make a book without even having to do anything. So that was the basic premise. My job would be to get a few innocent bystanders to talk to me for five minutes, during which time I would evaluate just how uninformed their views were. And if they were worthy, I would throw my name around. Said people would jump at the idea of being published for little to no effort, and I would jump at the idea of laughing at everyone’s thoughts. Again. Sounds like a good plan, right? So we’ve nominated you for The Sunshine Blogger Award! Pingback: Sunshine Blogger Award | Would you like some tea with that?